Happy New Year to all out there and I hope that you all survived the celebrations. I have decided to start this year of 2012 posting with a challenge to get the creative juices flowing. 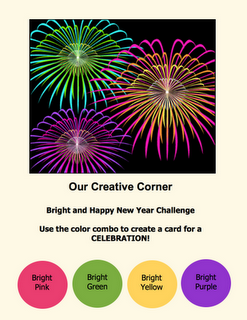 Our Creative Corner have set the challenge of "Bright and Happy New Year" with the following bounds. For the record, the other colours used were Rose Red, Poppy Parade and Peach Parfait. As for the celebration part, I figure these cards are so generic that they can go with a "Thinking of You", "Happy Birthday" or even a "Hello Friend". The other massive 'celebration" is that I boosted my cards stash with 7 bright and cheery cards. Thanks for popping by, and if you get a chance, pop on over to Our Creative Corner and have a look at what the DT and other creative souls have put together. Happy New Year Lynda! Love this set - I like having generic cards on hand to use for any occasion. Wow, Lynda, these are wonderful! I really like you idea to make a set using the color challenge. Thanks so much for joining us this week at Our Creative Corner... your cards are fabulous! Well just GORGEOUS and so very classy!!! Love the bright colours!! I hope you and your family had a wonderful xmas and new year and that 2012 brings you health and happiness!! Hmmm must use your email notificatio,should be able to keep up with you then. Very beautiful set of cards using the color challenge, love that stamp set! Thanks so much for joining us at the OCC! Oh my goodness Lynda ... what a fabulous array of cards ... you have certainly pulled this challenge off to perfection ... love the design too ... great job! Lovely cards Lynda. I love how you interpreted the fireworks with the flower stamp. Happy New Year.